Place fish in shallow glass dish. Add lime juice, cover with plastic wrap and marinate for 2 hours at room temperature or until opaque. (The fish will not "cook" as quickly if refrigerated.) Stir occasionally. In small skillet heat oil on medium, add garlic, and slightly flatten with fork, sauté for 3 minutes. Let oil cool, and discard garlic. Pour off excess lime juice from fish. Stir in onion and season with Adobo. Cover and refrigerate for 30 minutes. Just before serving, add cilantro, Tomato Sauce, Botanita, Sazón, Olives, garlic-oil and mix well. 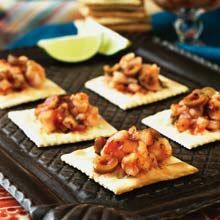 Serve cold with soda crackers.